21657 NETSP2973.jpg 500X638\NETSP2973.jpg 21658 NETSP2973_1.jpg 500X638\NETSP2973_1.jpg Send A Hint! Product Description: less text Show your appreciation to a strong and magnificent woman in your life with this amazing Pink Rose Admiration Box. 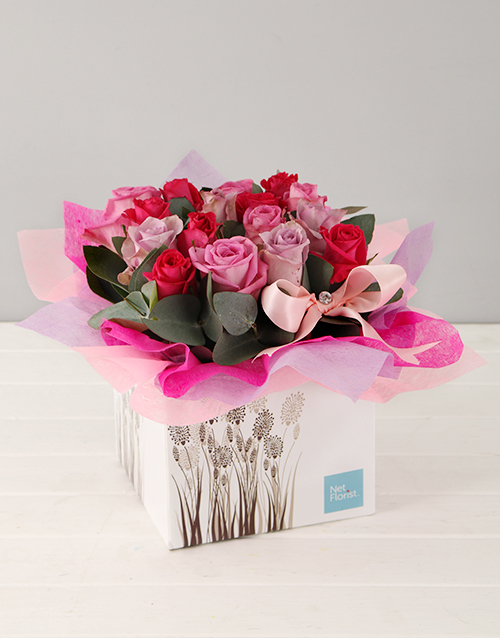 It consists of short-stemmed roses in assorted pink colours with gum leaves, gently nestled in tissue paper in shades of pink, placed into an occasions box and rounded off with a light pink ribbon and diamanté pin on top. Nothing shows appreciation more than receiving a gift like this! Rose colour may vary. 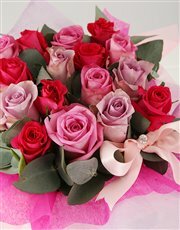 Get this Pink Rose Appreciation Box delivered with NetFlorist.